Back in March, iD Tech partnered with Code.org to offer 100 girls scholarships to attend summer camp at no cost. It felt great... but only for a moment. But here we are, four months after the fact. No recap post, and thus, no celebration. My lack of production hasn't been due to lack of time, or willingness to write. It's just that every time I sat down to put something together, my determination quickly faded. I immediately found myself stuck in frustration and firmly rooted in "this just isn't right" mode. The biggest problem was that the words I was using in an attempt to inspire and evoke enjoyment were lacking substance and any genuine feel-good value. I couldn't get past it. I mean, here we are sending 100 girls to camp for free… so what the heck is your problem, Ryan? Well, I got absorbed. To write this summary, I knew I needed to read a few of the scholarship survey responses. So I started with one student’s submission, and then another as planned. But then, I read another. And another. And then hundreds more. It got to the point where I couldn’t stop reading because each girl said something more powerful than the last. I kept telling myself that I’d stop reading when I finally got to that one response that lacked heart. The initial inspiration to write this post was fueled by knowing that 100 girls would soon be chosen to chase a dream. After reading hundreds of stories of girls expressing the fact that they didn’t have what they needed to chase those ambitions, that inspiration was squelched by a gut-wrenching feeling that one thousand young women would be denied. Not fun. The good news is that you're reading this, which means I got around to writing, which means I found solace: 100 girls—who may have not ever been given another chance during their lifetimes to get involved in STEM—are going to camp this summer to code, design, build, and explore. And what about the others? The many, many girls who were not selected for the scholarship? They've still taken the first, and very difficult step. Either they or their parents have come to understand the value in coding, robotics, or design. Better yet, they've learned that there are opportunities to pursue those skills. And even beyond that, they are formulating and envisioning how those skills could change lives, either their own or those of others. "By answering a simple question, girls can start to envision how STEM skills change lives—their own, or those of others." So thankfully, that one mental hurdle has been cleared. But as we all know, rarely does your path have just the one hurdle. That said, I understand why the question is asked. I mean, I feel the same way when I see that company XYZ is paying off grad school loans for a handful of select students. Why can’t they do it for tens of thousands more of us? I then think about what kind of commitment company XYZ would be required to endure, and realize it’s just not possible for one organization to bear. So anyway, that is the backstory of how I went from loving the fact that we were offering scholarships, to being frustrated by the limitations of it, to now coming to a stronger understanding what it all means. We have learned a ton through all of this, to say the least. Not simply about our camps and programs specifically, but about the interests and goals of young females in general. Their need for opportunity, and how they plan to take advantage of that opportunity when given the chance, is something we should all be aware of. So, I’d like to present a few survey answers; with the main questions broken down in a series of three posts, with this being the first. Over 1,400 girls/parents submitted the required application survey... a positive response that, while expected, was good to see. What wasn’t as expected, though—and making it even more amazing—was the enthusiasm, excitement, and passion expressed by many of the respondents when it came to communicating their love for STEM, their need for summer learning, and their desire to reach future aspirations. Their articulation of such points not only gives us the inspiration to do more, but it gives us hope that so many young girls are on a collision course with greatness. We let people know about the scholarship opportunity through our website and social media accounts, via code.org and their social media accounts, by email, and through local organizations, schools, and educators as well. The camps available for scholarship are for ages 6–18, so it makes sense the vast majority of respondents fell within that range. While it wasn’t asked where families resided, geographic information could be somewhat inferred from where respondents stated they’d like to attend iD Tech. 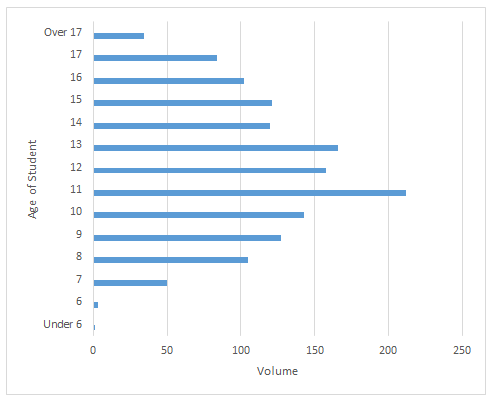 There were a number of respondents who mentioned multiple locations in their answers. For instance, D.C. residents often mentioned locations in Maryland and Virginia, as Kentucky residents did with Indiana, and vice versa. 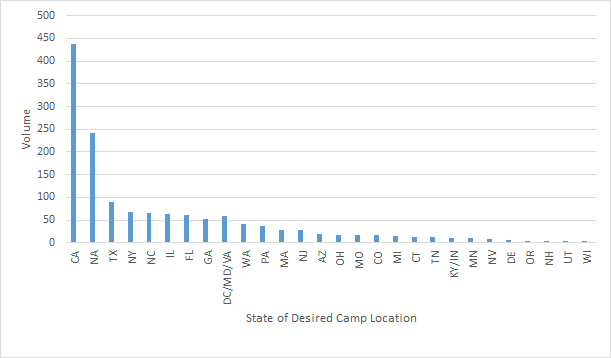 Thus, a few states were combined (as shown in the chart below). That said, if someone mentioned they wanted to attend a location in California and another in Arizona, their responses are reflected as "NA" (and not counted for both California and Arizona). iD Tech is based in California, so we have more local ties across the Bay Area. More educators, schools, and students were reached in Silicon Valley, which explains why there are so many more responses from California versus other states. Not to mention the sheer size of the state in relation to others. Again, the main question covered here is “Why do you want to go to camp?” which was completed by the student, not the parent. In over 1,400 responses, you can imagine there was a ton of variety in terms of the different words used. Filtering out “stop” words like “the,” “and,” “that,” and others that don’t have much value out of context, here is a word cloud that summarizes a few of the stronger trends (larger words are those that were mentioned in the answers with more frequency). 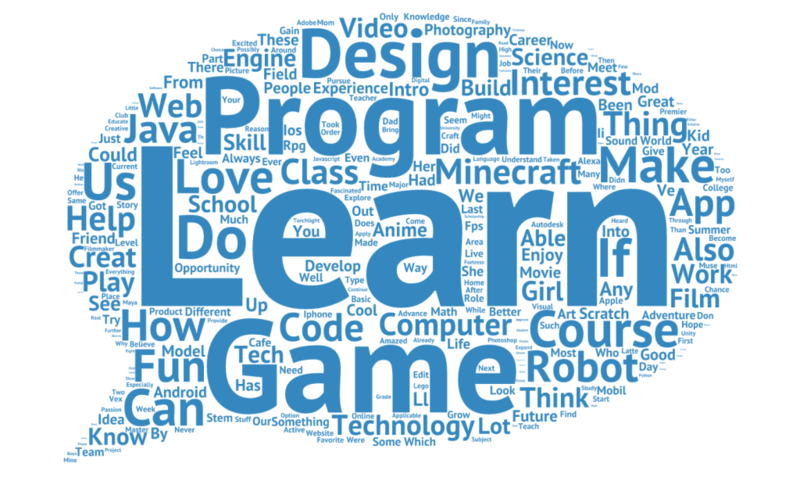 “Learn,” “program,” “game,” “design,” “robot,” “Minecraft,” “App,” and more. These are words you wouldn’t normally associate with “summer camp,” but that has obviously changed. The value of early childhood STEM programs and the absence of such skill-building throughout the school year is a big reason why many use summer to continue learning. But the real takeaway value comes from looking at answers in their complete form. "I know I have a lot to learn about computer programming but my school does not offer classes like that. I would love to be accepted to the RPG Game Design with Torchlight ll. I enjoy role-playing games, and always thought creating one would just be AMAZING! I have always thought it would be awesome to create my own video game ever since my mom got married and my new dad got me interested in electronic gaming. I have wished, hoped, and dreamed, of being able to help out with these types of things. I believe this would be absolutely amazing, and hope that I can join!" "I have always been passionate about STEM. My school has science and math classes. However, I have very limited exposure to technology, engineering, and computer programming. I am very excited when I find out all the wonderful courses that iD Tech camp offers and especially the scholarship opportunity for girls. I know it can help fill in the gap between my passion and knowledge..."
"I am curious about programming but it is not offered in public schools. I am interested in the Mills College program because it is exclusively for girls. The few programming camps available are dominated by boys." "I would like to go to camp to explore more hands-on activities that I do not get in school. I am interested in Adventures in Minecraft Game Design." "I want to go to this camp to further my knowledge in programming so that one day I can teach others how to code, especially girls. As a member of my school's all-girls robotics team as well as Girls Who Code, I have been fortunate enough to experience programming without feeling the pressures of the gender gap in computer science. These all-girls programs have helped me become comfortable in STEM, but the pace doesn't feel challenging enough for me. In a weeklong camp at iD Tech, I believe that I can further my knowledge in programming to the level where I can teach other girls how to code. I would like to take Java Programming or C++ Programming, as they are very applicable languages in technology right now." "I want to attend camp for Robotics Engineering & Programming with VEX because I would like to learn more about programming and get more hands on experience building a robot from start to finish so I can gain a larger role for my school's robotics team next year." "I would love to attend an iD Tech summer camp because I feel that it would enrich my knowledge in the Computer Science field, which I am studying in school. I feel that I have to learn more in this domain to help resolve some everyday problems that affect myself as well as other people..."
"I want to do this camp to learn about building robots. I am interested in Engineering and Programming with Arduino and Robotics Engineering & Programming with VEX. I am in a robotics club at school but the seniors rarely have time to teach the younger kids to work with the robot." "Attending this camp will help me get familiar with upcoming technologies. I am interested in working with different technologies such as creating movies, digital photography and creating/maintain websites for my clubs at school. I plan to pursue my career in the field of Science and this camp will help me learn more about technology and its application to the real world. I plan to graduate high school wit a diploma in STEM (i.e. focus in Science and Technology)." "I would love to go to this camp so that I can learn new skills that will prepare me and support my future. I feel no matter what career path I choose to take, there's a definite possibility I'll use technology. By going to this camp, I can gain a newfound love for technology, although I love using technology already, and possibly be one of the few women to graduate with a degree in computer science in the future. I would like to take the Mobile Game Design for iPhone & Android, Movie Making Camp with Adobe Premiere, and/or Web Design and Photography courses (that are overnight)." "I want to go this camp because I really enjoy the computer programming class that I am currently enrolled in at school. I find programming challenging, but worth the immense amount of work. If I get the opportunity to take part in this camp I would want to produce movies, create mobile apps and code with C++. I feel as though I have not been introduced to the monumental amount of career paths that I could take and I feel as though this camp could possibly aid in my future career choice." "I would like to go to this camp because of its unique opportunities that would help further my life and career choices. This would enable me to have different options in life and truly do what I aspire to be later on. I believe that this program would advance further career choices. This program to me is a symbolism of female empowerment by teaching these STEM classes and showing how girls can also be in the same kind of environment and encourages female participation. This program is a way in which I can prove to myself and others that I am capable of choosing STEM degrees. Game Development, Programming, Web Design, Photography, and Filming. I would like to take all of these however I would be more interested in Programming, Game and App Development, and Web Design. These are the classes I would like to take because of the creativity and flexibility these classes have. These classes would provide the means for me to input my own ideas and further them using this knowledge. In this day and age technology is advancing at a more rapid pace than ever before and to be a part of it would be spectacular." "I would like to do the classes on film/video. I love to be creative on social network and want to learn more about how to use the photos and videos I take. I would love to meet other kids that have similar interest in being creative through film." "I want to go to this camp because previously I had taken an individual online course that taught me basic computer skills. Now, collaboratively, I want to produce useful programs in different coding languages with input from my peers. I wish to take one of the following courses: Java Programming, C++ Programming, or Game Programming for Apple iOS & Android with Unity." "I want to go to this camp in order to learn more about things such as game design and programming. These topics interest me and as viable career paths, and I would like to delve more into them. I would like to meet peers with similar interests to mine." Powerful, right? And that is only about 15 responses. I've barely brushed the surface of the different emotions poured out through the many completed surveys. Not to mention that this is just one question of a handful! Sometimes it just takes one question to spark greatness. I bet many parents were surprised at just how much thought and detail went into their daughters’ survey answers. There are many, many girls out there who want to take the first step on their STEM journey. Even if you aren't a tech parent, there is so much that can be accomplished by simply introducing available resources, both online and off. The opportunity to strike while the iron is hot may fade quickly. Take any indication that your daughter might be interested in STEM and run with it. Thinking back to the ups and downs of writing this post, and weighing it against all of the potential good that has been created, all of the fretting seems so silly now. An opportunity for "only 100 girls” is probably the most inaccurate way of looking at it.